MDPen / Blog / Is Microneedling Safe for Teens? The teen years are characterized by many changes. Along with trying to figure out what they want to be when they grow up, teens are experiencing many new discoveries, new experiences, new emotions, and a new body. Hormones influence not only a teen’s body, but also a teen’s skin. Hormones in teens causes your skin to increase oil production, which causes acne. And in most teens’ minds, acne is just not cool to have. Luckily, there are many ways to prevent acne in teens and treat acne in teens since acne is not 100 percent preventable due to its root in hormones (that obviously are not preventable!). MDPen is a leader in microneedling pens. What is microneedling? Microneedling is a non invasive skin care procedure that stimulates collagen production (what makes your skin plump) in the lower levels of your skin. 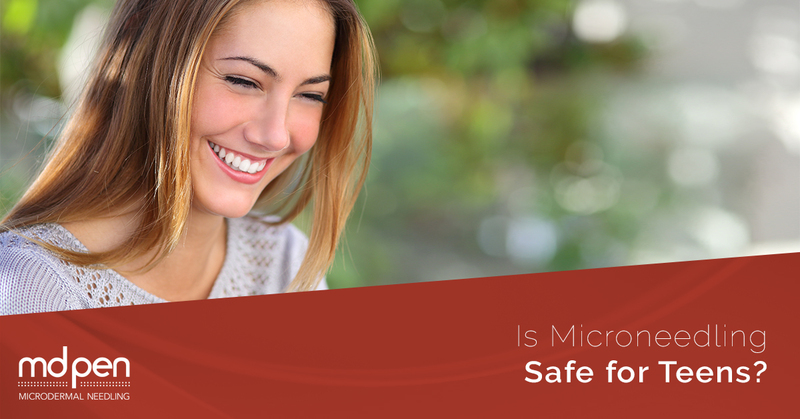 In this blog post, MDPen will lay out the facts of skin care for teens and explore the question: is microneedling safe for teens? Hormones begin to kick into high gear in the teen years, which is when your skin begins to be affected by hormones as well. Male hormones enter the bloodstream and stimulate oil (or sebum) activity in boys’ skin by causing glands in the skin (known as sebaceous glands) to produce oil. Acne is usually caused by blocked and hardened sebum deep in the skin’s pores that become inflamed due to dead cells that line the hair follicle and create bacteria. Sebum’s job is to keep the skin moist. Your skin’s hair follicle contains bacteria that normally gets enough oxygen to kill the bacteria (bacteria can’t grow in oxygenated environments). Acne forms when your hair follicles overproduce serum, cause a clog in the hair follicle, preventing oxygen from penetrating, and results in a blemish or a break out. Redness, inflammation, and swelling result in the dermis of the skin. White blood cells recognize the bacteria as invaders and immediately begin to fight off the infection. These blood cells die off and create visible white pus, and as long as your body is healthy, acne will go away on its own. If you squeeze it, however, you risk acne lasting longer as the infection could penetrate to the deeper layers of the skin. Boys are more likely to have more breakouts during their teen years due to testosterone over-stimulating the sebaceous glands; whereas, girls will have less breakouts, but can have breakouts longer due to hormonal fluctuation caused by their monthly cycles. Find a non-drying and deep pore cleansing skin care routine. Since acne is caused by oily skin and dead skin cells, you’ll want to counteract these mechanisms. Teen’s skin is usually quite sensitive. Most acne products dry out the skin and is full of harsh chemicals that can actually increase inflammation, which is something you don’t want to do. Instead, invest in all-natural skin care products that exfoliate the skin. One great ingredient in skin care products to do just that is salicylic acid. It actually reduces acne-causing bacteria and oil within the follicles, decreases redness and discoloration when you do have a breakout, and does not irritate the skin. Wash twice a day. It’s important to wash away all the gunk from the day before you sleep, and it has a chance to seep in, as well as washing in the morning. Use a toner. Using a toner after your skin care routine that is free from alcohol will help seal in moisture content without drying your skin. Skin cells need water in order to stay healthy and fresh. A toner in your skin care routine will also remove any excess impurities that you missed before or from the tap water. Wear sunscreen. Look for a sunscreen with zinc oxide. Zinc oxide is an ingredient that calms the skin and is an anti-inflammatory. Zinc oxide also helps with the fading process of blemishes. Acne scars are caused by inflammation of the dermis, which causes pigments to appear on your skin. UV rays actually help pigments stay around longer. Zinc oxide helps protect your skin cells from UV rays so your damaged skin cells can heal. Sunscreen is found as an additive in a lot of moisturizers, so this is easy to add to your skin care routine. Furthermore, wearing sunscreen every day protects your skin from early signs of aging, such as lines and wrinkles as well as skin cancer, which the sun helps to cause. This is one good habit you’ll want to keep for life. Use a lightweight lotion. Moisturizing your skin is important. However, teenagers don’t need any more oil added to their skin. Thus, look for a lightweight lotion that has a very high water content and low oil content. Perform facial masks. While moisturizing, toning, and cleansing your skin will go a long way in preventing acne breakouts, for teenagers it’s usually not enough. You’ll have to invest more in your skin care routine in order to prevent breakouts. One way to do this is to add in a facial mask to your skin care routine once a week. This is a deep cleansing and disinfectant that can be very beneficial to your skin. Invest in professionals. Teenagers, with all their happenings, can be very lackadaisical when it comes to routine, including skin care routine. Having a professional perform a skin care treatment, such as facials or microneedling, can be very beneficial when daily maintenance is not-so-daily. Be mindful of your diet. Certain foods are not good for us overall, but some aren’t good for our skin. Cows that are fed growth hormones are one of these that can cause your skin oil to go haywire. Avoid yogurts, milk, and cheese that are not hormone-free. Don’t be afraid of spot treatments. Not all acne is created equal. For instance, if you get cystic bumps, one treatment may not exactly help it. Tailor your skin care routine for your individual skin cells. Consult a dermatologist or an aesthetician who can help you pinpoint exactly what’s happening with your particular skin type and how to treat it. Lifestyle. The teen years are a wonderful (yet confusing) time of self-discovery and exploration. However, it’s important to take care of yourself during this time. Getting enough sleep, eating healthy, exercising, and not taking recreational drugs or drinking is important not only to your skin but to you overall as a person. WHERE DOES MICRONEEDLING FIT IN WITH SKIN CARE AND TEENS? Despite your best efforts, you may still be left with acne scars as a teenager, especially if you didn’t take preventative measures early on. Microneedling is a non invasive skin care procedure that is highly effective at diminishing the appearance of acne scars. Microneedling works by creating tiny micro injuries in your skin that trigger your skin’s natural healing process. This healing process stimulates collagen production, which is the protein in your skin’s cells that gives it strength and elasticity. When your body has an injury, new skin is formed to replace the old skin. Microneedling mimics this effect, with the result being a new layer of skin that is free from scars. Scars, being inherently a cosmetic condition, are something that can affect your self-esteem and self-confidence, especially as a teen. Acne as a condition in itself has no cure, but it can be treated, usually with an advanced and professional skin care treatment such as microneedling. Microneedling is best done by a professional. With at-home microneedling, you can perhaps exacerbate your condition if you perform the procedure incorrectly, or worse, create even more scarring. Professional microneedling involves the best microneedling pens that are tailored to your specific needs. The needles can be adjusted for skin depth penetration, thereby treating your exact need. At-home microneedling pens have short needles, which may not be long enough to even penetrate the layers of skin you want to target. Acne affects over 85 percent of teens and about 50 million Americans suffer from acne every year. It’s the most common skin condition, and many just accept it as a part of life. However, with microneedling and other skin care procedures, you can treat acne effectively. MDPen supports aestheticians, spas, and clinics that offer microneedling to help patients who suffer from acne. We make the best microneedling pens with adjustable depths to target the areas you need targeting. We offer microneedling training courses to equip and certify those who wish to offer microneedling in their practice. We produce the best microneedling serums that will not only promote healing for microneedling before and after, but will also help yield better results. Our microneedling serums are designed to penetrate the micro channels that were created by the microneedling pen, delivering powerful ingredients to the lower layers of your skin, promoting collagen and elastin growth. Our microneedling serums also can be used as part of your regular, on-going skin care regimen. All-natural and effective, MDPen’s microneedling serums use only organic ingredients, designed to cleanse, moisturize, heal and protect your skin day-in and day-out from the elements, the environment, pollutants, and free radicals. Microneedling is safe for patients of all ages and microneedling benefits are many. After all, we all have the same underlying skin components. Teens may need the permission of their parents, depending on their age. If you have doubts, any professional microneedling practitioner would be happy to sit down with you, answer any questions you may have, and review your options. Furthermore, consulting an aesthetician or dermatologist is also advised if you are unsure about microneedling. Other non invasive cosmetic procedures, such as chemical peels, microdermabrasion, light therapy, and cortisone injections have also been used to treat patients suffering from acne. MDPen offers support for all of our microneedling practitioners. We offer marketing materials and product support. Our microneedling pens are covered under warranty, and our customer service representatives will be happy to assist you in any way. Once you are trained and certified in microneedling pens, we offer advanced microneedling workshops that offer hands-on opportunities as well as continuing education on microneedling treatments and procedures. Because we are so passionate about microneedling and how it can help people, we offer financing on our microneedling pens to help practitioners offset the initial start-up costs. MDPen believes in the power of professional microneedling to alleviate skin conditions, such as acne scars and skin discolorations, help with stretch marks, encourage hair growth, and help ameliorate the signs of aging. Appearance is so important in today’s society, and we are extremely blessed to be living in such a time when we don’t have to suffer needlessly. Looking your best doesn’t take a lot of time or money. Consistency is the key. If you have questions about microneedling and how it can help you, visit our website, our Facebook page, or our News page. We post videos of microneedling procedures being performed at our Advanced Workshops. We post informative articles on all of the benefits of microneedling, as well as skin care tips and tricks. MDPen stays abreast of the latest in microneedling technology, such as RF Microneedling and Vampire Facials, both of which use microneedling in their treatments. MDPen desires to help people live their best life possible and feel good about themselves in a healthy, positive way. Contact us today for more information!